Do your business teams suddenly need wall dividers for office meetings on the fly? Do you need to create temporary office spaces with portable office walls when you have an influx of workers? Do you need noise-diminishing, multipurpose, portable office partition walls to create meeting spaces, to be rolled away quickly and stored in small spaces when you don’t? Screenflex offers modern office partitions that arrive fully assembled and can serve as temporary office walls immediately. Our office space dividers are versatile and allow you to create temporary office walls when and wherever you need them. The world of business is unpredictable. Sometimes, your infrastructure and current capacity can’t keep up with your talent management needs. Many industries, from nonprofits to insurance agencies to corporate call centers, need to create an office environment one day, only to break it down within weeks. Why invest in a full set of permanent dividers or cubicle walls when you can get folding, accordion office partitions that are moveable and can be rolled to another spot in your building as soon as you’re done with them? There are a variety of floor plans and setups that one can use to create that temporary office space, and folding them and rolling them away takes only seconds! 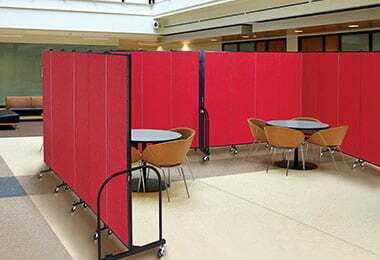 Our noise-reducing room dividers, which can block up to 65% of direct sound waves from a source, can help you lessen distractions so that your teams can conduct more effective meetings, free of interruptions that normally come in open areas between cubicles. Split the space you have with office wall dividers that can be moved, rolled, and bent into the exact shape of meeting space you need. You can even customize your office panels so that they have wet-erase features, so your managers will have a whiteboard handy to explain plans during their meetings just by opening up the folding office partition. Distracting foot traffic can cause interruptions, and many people will go to the nearest person for information than a designated receptionist or administrator. Funnel traffic to the right areas, such as to a reception desk, with these freestanding, temporary office walls. Separators like these can unconsciously direct visitors and vendors to where they need to go without interrupting the work of your entire staff. On the outside, you can feature your logo and give your office room dividers a professional look. On the inside, your workers can tack up paperwork and charts on the panels, as this wide surface area is also tackable and useful as an area for information-gathering. Whether you need to create office space, increase privacy, offer more meeting rooms, designated areas, or just help to increase productivity overall, these office wall partitions can get the job done. There are just so many ways to use Screenflex office partition panels in your office space. Our customers love the versatility, noise-reduction, study design, the Screenflex office divider panels offer, along with the fact that they’re made in the U.S. If you have questions about our office privacy panels or if you’re ready to buy now, contact us online today and we’d be happy to help you in selecting the right office room divider for your space!